You will soon be able to turn your Ursa Mini into a fully functional studio camera with Blackmagic Design’s Ursa Studio Viewfinder. It features a large 7” high-resolution screen and is perfect for camera operators working on live events at which they need to stand behind the camera and capture the action for hours on end. The viewfinder features an all-metal design with variable tension mounting points, as well as an articulated arm so the viewfinder can be raised, lowered, moved forward and backward. These mounting points can be adjusted for just the right amount of tension so you can pan and tilt the viewfinder to whatever position you want. Super bright 7” high-resolution viewfinder with detachable sunshade. Large handles and variable tension articulated pivot points to adjust viewfinder position. Tactile physical dials, knobs and customizable function buttons for quickly adjusting settings. Large RGB LED tally indicator with clip on perspex camera numbers for easy camera identification. Integrated V-Lock mounting plate for quick setup and attaching to the URSA Mini top handle. Connects to SDI input and power from camera, so no extra cables or power supplies needed. 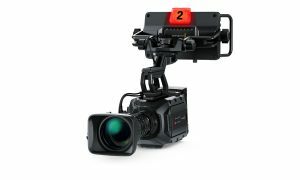 Compatible with Blackmagic Video Device Embedded Control Protocol for full control of camera functions such as talkback, tally, color correction, image detail, gains, all lens functions and much more. 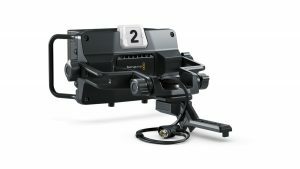 NAB 2016, Las Vegas, USA – April 18, 2016 – Blackmagic Design today announced the new Blackmagic URSA Studio Viewfinder, a high resolution 7” studio viewfinder with variable tension mounting points, tally, external controls and more that turns Blackmagic URSA Mini into a true professional studio camera. Blackmagic URSA Studio Viewfinder will be demonstrated on the Blackmagic Design NAB 2016 booth at #SL217. When combined with the URSA Studio Viewfinder, URSA Mini becomes the world’s most advanced Ultra HD live production camera. 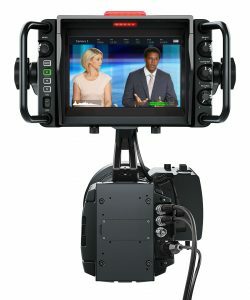 Unlike traditional studio cameras, which use older video technology, URSA Mini is a true digital film camera combined with a DaVinci Resolve YRGB primary color corrector and full broadcast studio camera features. That means customers get a new generation in image quality with incredible texture, detail, color and dynamic range that are far superior to standard broadcast cameras. There’s also a B4 lens mount available that lets customers use their existing broadcast HD lenses with full lens control on URSA Mini PL. Super bright 7” high resolution viewfinder with detachable sunshade. Product photos of the Blackmagic URSA Studio Viewfinder, and all other Blackmagic Design products, are available at www.blackmagicdesign.com.